Today is Palm Sunday, and in churches all over the world, talk of a parade was paramount. Recorded in all four of the New Testament gospels, is the event of Jesus riding on a donkey, as he entered the city of Jerusalem (the City of Peace … ironic don’t you think, that a City, so very mired, today, in conflict was named a city of peace? … but, I digress). This all happened as the festival of Passover was beginning. Exodus 12 tells the story of the original Passover (Passover). The Israelites had been enslaved by Egypt, for many generations. God instructed Moses to have His people slaughter lambs, and cover their door frames with the blood. Then, in the night, the firstborn of every family would be killed, except for the households whose door frames are covered in the lambs blood, because the destroyer would ‘pass over’ those homes (this was the final of the ten plagues used to convince Pharaoh to let the people go). Moses did as God asked, the Israelites obeyed, and the Passover story came to be. Even in the home of Pharaoh, the firstborn of every Egyptian household was slaughtered. But the people in the homes that were covered by the blood of the lamb, were spared, and Pharaoh set the Israelites free. Later this week, on Good Friday, in churches all over the world, talk of a parade will be, again, paramount. Again there were crowds of people. Again there was shouting. This time, there was no “Hosanna”, there was no ‘save now’, being sung out. Instead the shouts were “crucify him.” This time it was all a parody, all a mockery of the earlier parade. Each of the gospels mentions his walk to Golgotha (the place of the skulls), where Jesus was nailed to the cross that he and Simone of Cyrene carried there. That walk, that parade, was after being wrongly tried, convicted, flogged, and had a crown of thrones pushed onto (into) his head. This parade was the parade of the lamb of God (the Son of God) to the slaughter. And his blood, shed for all of humanity, is what sets us free. Ann Lamont shared the words, above, spoken in her presence by poet and author, Wendell Berry. It was a dark and stormy December day. Today is a rather dark day, as the sound of rain falling interrupts the Christmas music playing in our house. Or is the music interrupting the rain falling? In our world there is much darkness, much hatred, much too little peace … too little peace on Earth. Darkness is the backdrop of our world and our lives, today, as it was that first Christmas, when love and light came to us in the form of baby. The innocence of a helpless, dependent baby, in the arms of his mother, who he came to save. Delivered in the arms of a world, who he came to save, to redeem. And, as a helpless babe, he was entrusted to a dark dark world. A world given the choice to love him, or reject him. To embrace him, or abandon him. But, this celebration of Christmas is about how the light of that helpless babe still shines. It shines in his birth foretold so long before fulfilled. It shines in the Christmas story fulfilling the prophesy. It shines in you and me, those of us who claim his redemption, who live illuminated by his love within us. Merry Christmas is not a message for red cupped retailers, or turkey dinners or reindeers with lit noses. Merry Christmas is the message of the word, become flesh, in the form of a baby, arms stretched open towards all of humanity, giving light to a dark world. When I was growing up (back in the stone ages), there were two main faces of Christmas; the Christ child and Santa Claus. Although I did not grow up in a family who was active in their local church, I did not grow up confused by the pair who I grew up connecting to Christmas. Santa was a good, and gentle man, and the stories of him fed my dreams of a magical character who existed to reward my good behavior. The Christ child was an innocent baby, who was born to eventually die, so that I would never have to deal with the consequences of my human sin. and the other lived in my heart. Many speak of how ’empty’ their homes feel once Christmas is packed away for another year. I have to admit, cleaning away the decor of Christmas is something I usually am ready to do by about noontime on Christmas Day. This year I waited patiently until December 29th. When the last of the boxes was placed on it’s shelf, and the final needles from the tree vacuumed up, I then moved on to cleaning up the food of the season. The best way to do that was to encourage my son to have a couple of his fourteen year old, male, friends over for a day of video gaming … food cleaned up! Once Christmas got packed away I looked forward to the following morning, when I sat down in my cozy chair, with a steaming cup of brew, and admired the clutter-free house. It is then that Christmas hit … as though for the first time of the season. I sit in the quiet of the still dark room and pondered the season we just celebrated. Mary was young … really young … young like my fourteen-year old son. Still a child by today’s standards, but a young woman in her day. Preparing for her upcoming marriage to Joseph, her plans were knocked off their axis when she was visited by a stranger, who announced what was to come … a baby. 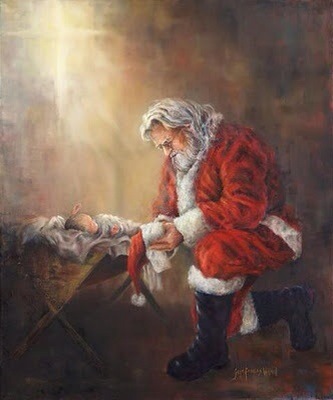 No, not just a baby … the Savior. The long-awaited Messiah. Her wedding plans altered … did she realize her plans for the rest of her life were altered as well? Joseph was planning and preparing to wed his betrothed by creating a good name for himself in his community and by laboring to establish a home for them to share. The reputation he had worked so hard to create was now to be destroyed by the news Mary shared … she was pregnant, and he knew this child did not originate in the sparkle in his eyes. As a man of honor he would divorce her quietly (engagement in those days was a legal contract, as binding as marriage). Then, he too was visited by a heavenly stranger … the nest egg he was planning to use to start a life for two, would now be needed to support three. What a drama, a thriller, a mystery! How is it that, I do not fully grasp the weighty significance of the Christmas story until after it is over, until after all of it’s symbols are packed away? Maybe our focus is so directed to the symbols of Christmas we miss the figures they represent and the story they should lead us to ponder. The story of sin-filled people, in need of and waiting for the arrival of their Savior … Messiah. The story of God sending that Savior in a most unexpected, unassuming way … the way every person enters this life … as a baby. Unlike the baby Jesus of our Christmas nativities and carols, this one did not stay a baby. He grew and skinned his knees, and learned his lessons, and did his chores. He began his ministry and taught lessons, and performed miracles, and loved the unlovable. He was crucified, died, buried, rose again. This Christmas gift was never given with the intent of being packed away until next year … that is only for the symbols. What God gave was never intended to only be a symbol. I cannot imagine the insecurities of Joseph, the husband of Mary (Matthew 1:16). The man was not only the earthly father-figure of the Messiah, but he was also married to the Virgin Mary, who was chosen by God, to be the vessel through which God would come to Earth! That, is alot to live with under one roof! Really, I do wonder about Joseph. I wonder what kind of a man he was. I wonder what he thought about his virgin fiance being with child. I wonder if he felt like he was father to Jesus. I wonder if he felt his role was understated. I wonder if he felt it difficult to correct Jesus, as a child (or did he need correction?). I wonder if he felt used, unjustly treated, minimalised. The Bible really says little of Joseph, but I do not think that his role is minimal, after all he was chosen, by God, to be the husband of Mary, the mother of Jesus as well as to do all that an earthly father does for his child. Joseph married his fiance (knowing that the child she was carrying was NOT his), worked to earn an income, helped to raise Jesus, and moved around whenever he had a dream telling him to. Being engaged to a pregnant woman during those biblical times was not a politically correct position to be in. He could have had her stoned (adultery), he could have left her publically, but he didn’t want her to ‘disgrace’ her (most of that time would think that it was she who disgraced him), so he planned to divorce her quietly. Joseph is one of the small, elite group of people of the Bible who have been given a message through an angel of the Lord. He did not ask for it, he had already made the honorable decision about what to do with his Mary, before any angel entered his dream world. He is also of the line of David, a royal line that was part of the big picture plan of God. Joseph did not even get to choose the name of the child that his betrothed was to give birth too. Even that was not in his power or choosing … but, he did it! He married her! He did not divorce her quietly, but he took her to his home. This would increase suspicion that the child that Mary was carrying was his … he put himself in a position of public ridicule. Hum, how do I expand on this point … ? So, Joseph … a young man … pregnancy takes nine months … Joseph takes her home as his wife around three-four months … so they would be married, without consummating their vows for about four months before the baby was born, and then another two weeks after the birth (before her ritual bath). So, married? Yes. Joseph experiencing marital physical closeness? No. Enough said! Joseph was a man, chosen by God, because God knew that Joseph was an honorable man, who (obviously) sought to ensure the validity of God’s plan. And really, I doubt he was full of insecurities … I expect that he understood what it was to fully seek God’s will for his life. What an amazing man he was! God knows what He is doing, both now and always. For instance, He knew what He was doing when Mary was chosen to be the mother of the Christ child … and not me. If I were to have walked in the shoes of Mary, and been visited by an angel (that is big enough as it is) who told me that I, a virgin, was to be inseminated by the Holy Spirit and give birth to the Son of God (and not even have the honor of choosing the name of my firstborn) I would not have replied, “I am the Lord’s servant, may your word to me be fulfilled” (Luke 1:38). Then off she goes to visit her cousin Elizabeth … if it were me, my intent would have been to flee the realities that were going on, and to bury my head in the sand, as the great ostriches do to avoid their problems. But no, there is no avoiding reality from her first words, when Elizabeth’s pre-born boy decides to do cartwheels at the sound of her voice. And the unfair things did not stop there! After Joseph got his angelic visit, and he hoped on board, they had to head travel to be counted in the census that Caesar decided was necessary. So off the pair trod, Mary VERY pregnant, and the two undoubtedly still confused. Then, upon arrival at their destination of Bethlehem, there is not a room left for them to find refuge, and for their baby to be born. God knew what He is doing, then and now. He does not ask any more of us than we can handle, and being the mother to the Christ child would definitely be more than I could handle.